Welcome back! I have a few cards that I haven't shared yet that feature stamp sets and other items that will be retiring May 31st. And, this past weekend, I made some cards using items from the upcoming Stampin' Up 2013-2014 Catalog that I was able to order during the Sneak Peek Promotion. So, for the next few days I'll be featuring something old, and something new together. Thankfully the Storybook Friends Clear-Mount Stamp Set is sticking around in the new catalog, but the Tea For Two Designer Series Paper from the Spring Catalog will be gone after May 31st. It's possible that this is one of my favorite paper packs ever! And, it's also possible that I bought more than one pack and will be hoarding it soon. The base of the card is Crumb Cake Cardstock. The little bunny is stamped in Jet Black Stazon on Watercolor Paper, and I watercolored him! The finishing touches on the card are the So Saffron 3/8 Inch Taffeta Ribbon and Designer Buttons - Subtles Collection which are both retiring. Get them while you can! Next up, lots of new stuff here! 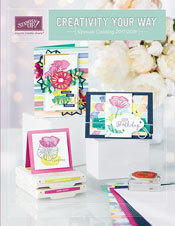 The card base is made from one of the new 2013-2015 In Colors called Crisp Canatoupe. I stamped the background with the splatter stamp from the My Paper Pumpkin Welcome Kit. The numbers and the graph paper are both prints from the Soho Subway Designer Series Paper. The happy birthday greeting is from the Label Love Clear Mount Stamp Set stamped in Island Indigo. And, the button is one of the new Very Vintage Designer Buttons. All of these products will be available beginning May 31st! From May 31 to June 3, you can order from both the old and new catalogs. The Island Indigo Baker's Twine is sticking around. Yeah! The other little panel is Summer Starfruit Cardstock, and is stamped with the arrow border from the Show & Tell 1 Photopolymer Stamp Set in Summer Starfruit Ink. This stamp set can be purchased alone or in a bundle with the Show & Tell 2 Photopolymer Stamp Set and the Seeing the Possibilities Online Class Ideas. That's it for today! Come back tomorrow for another round of Something Old, Something New. Thanks for stopping by!